In today’s generation, digital marketing is the first choice of every business worldwide. According to many research, it is in the record that the digital marketing industry is projected to be worth billions by 2020. There are many reasons for why digital marketing is on the upturn. With the help of digital marketing, it allows the businesses to assess to the customer response & it helps in measure the success of the marketing campaigns during the time of tracking and monitoring consumer search and that can helps in purchase patterns in the real time. Nowadays, growing internet accessing rates worldwide , all the people are engaged in using the smart-phones. Thus this makes rise in access over the smart-phones & tablets are also arose in the growth of the digital marketing. The increasing value of the smart-phones, tablets & the internet usage indicates, that the digital marketing is here to stay for a long time. Digital marketing is the innovative technology which enables businesses to reach clients faster and it provides effective delivery of the service which will be rolled out increasingly & the competition gets hotter. Worldwide demand for the professional digital marketers is expected to grow exponentially. 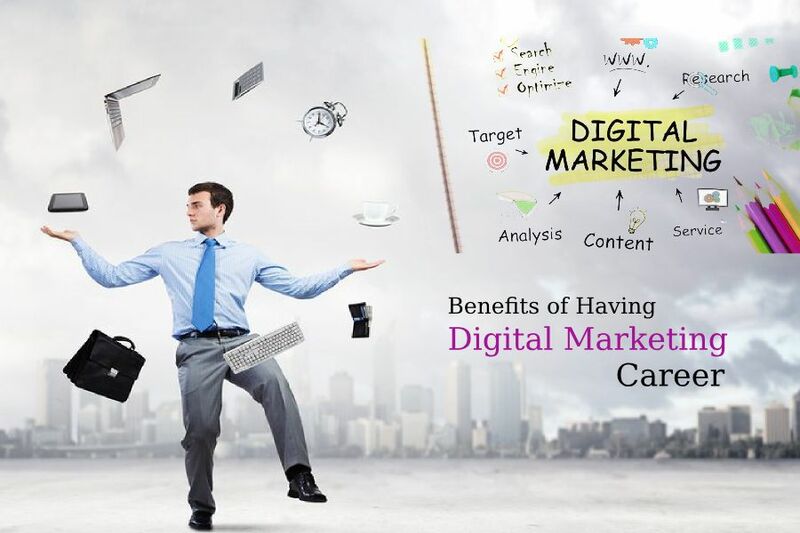 All the facts are the augur well for anyone keen on making a career in the digital marketing. Anyone who is looking at making a career in the digital marketing will be very beneficial extremely. There has a boom in the digital marketing. it has caused a major gap between the demand & supply with the professionals with the effective skills. As we consider globally, the number of the digital marketing is very high. As if we look on, the number of vacancies of the digital marketing professionals that appear on any of the reputed job portal is a clearly high indicator of the demand and digital skills gap. This medium provides the excellent opportunities to the persons who are interested in making career in the digital marketing. Jobs are available for the person who wants to makes career in it. If anyone has passion and the innate inclination for the profession. Then this is the right time for the person to enter in the digital marketing career. Fresher as well as professionals both can make their career in it. The median of the salaries across the worldwide is different. The pay scales is expecting to rise as increasing in number of the businesses step up and diversify digital marketing. Therefore, the digital marketing experts would be able to find the adequate employment opportunities. In the digital marketing there are several multiples functions. These functions include- Search Engine Optimization(SEO), Social Media Optimization (SMO), Data Analytics, Digital Content Creation, E-Commerce Management, Brand Management , Online Security and the myriad others. So, if anyone with having the passion for specific role can enter in this profession. Let’s take an example- people with having a good writing skills & the excellent knowledge can work as a content writer. those proficient in the mathematics will find great jobs in the data analysis sector.